It's been a while since my last post. 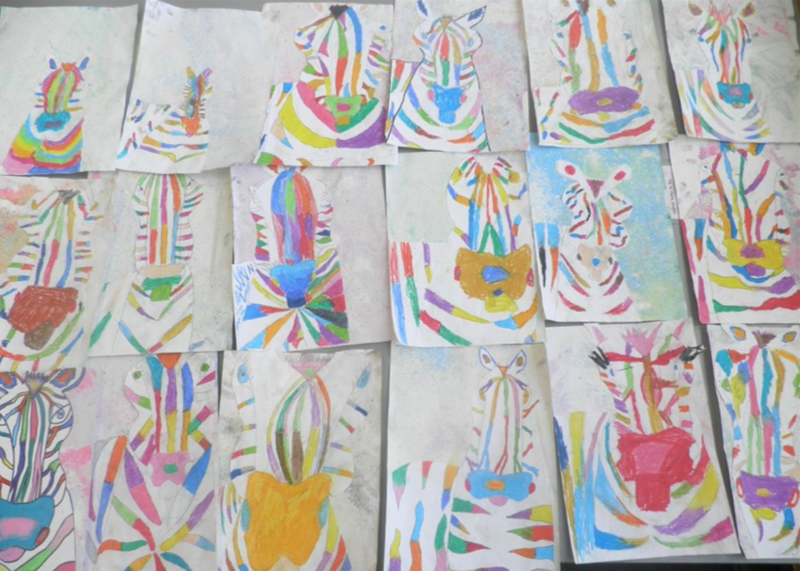 In our art lessons we've spent the past couple of weeks planning and designing African masks to finish off the unit. They should be finished by the end of the week and they're looking very impressive so far. 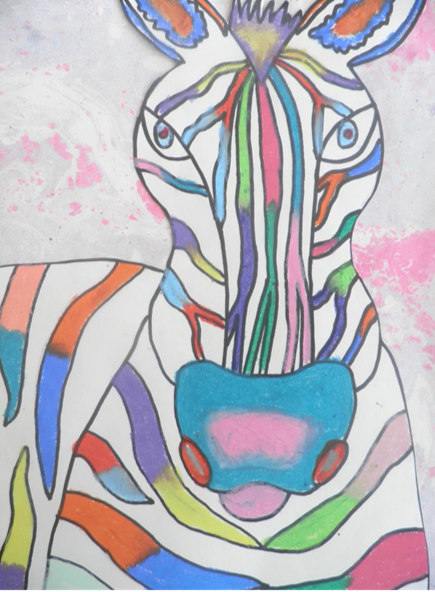 Our most recent art project with the art club has been these complementary zebras with a self-dyed chalk paper background. 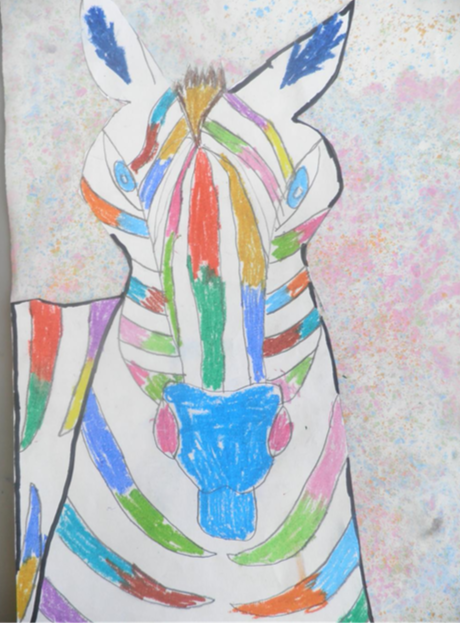 The zebras are very popular on numerous art blogs (usually analogous but I went for complementary to consolidate learning) and we followed step-by-step instructions from here. 1. Fill a tray with a few inches of water (large enough to dip an A4 sheet of paper into) and choose a selection of chalk colours. 2. Use a pointed edge (we used BBQ skewers) to scrape away at the chalk to make small bits and dust fall off into the water. Keep going with your different colours until the surface of the water if covered with colour. 3. Take your A4 paper and place it carefully into the tray. Leave it there for 5 seconds or so and then take it out. 4. Let it dry carefully. If there are spaces that haven't really picked up the colour you can either dip it back in or scrape some more chalk over that particular area. 1. Follow the step-by-step instructions linked in the first paragraph. 2. Fill each stripe with complementary colours. Blend where they meet. 3. 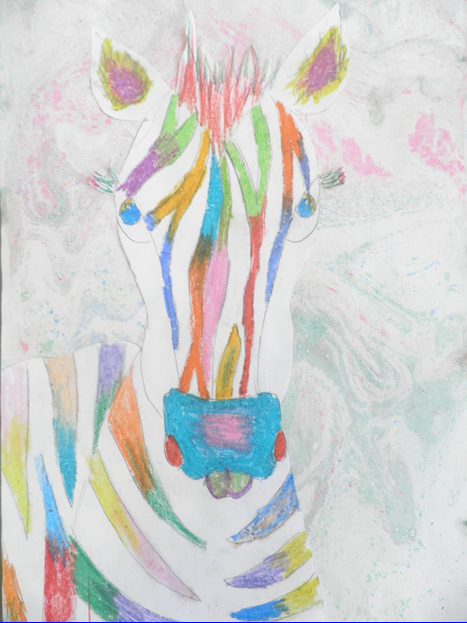 Cut out your finished zebra and stick onto the background. Here are some of the results of the club. Students are 8-9 years old and completed in roughly two 45-minute sessions. In all honesty, this might have been slightly too tricky for this age group but they gave it a good go. The instructions we used were good but there was more scope for errors here. 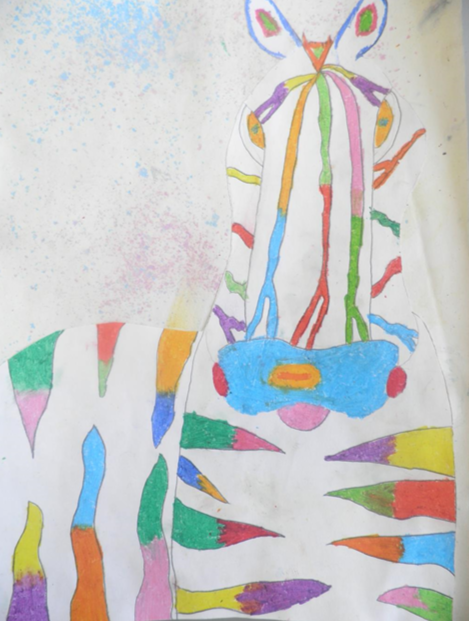 The backgrounds have come out much brighter than the pictures show and the kids really enjoyed making them. Good job art club. I'm sure these will get lots of attention on our display board from passers-by!